Hang on a minute Michael — if we shouldn’t publish more than 100 books, why are we being criticized for not doing more translations? Let’s say a German publisher can get 50 books by German authors — the rest have got to be translations I guess. An American publisher might find all his 100 places being occupied by domestic authors: how to fit in the translations too? There are just more people writing in English. If you are a French publisher, wanting as all publishers do, to expand, you can’t really go out there are get more French people to write books. So you look overseas. In consequence, regrettable though it may be in world cultural terms, books by English-speaking authors are just more important to Europeans than vice versa. We’ve got enough culcha of our own — more than we can cope with! Of course both of Michael Krüger’s assertions are nonsense. American and British publishers do publish translations: maybe not as many as French, German or Italian publishers do (though I have no idea of the numbers involved here) and of course the 100 title limit is really only there as a wry joke. The blog Three Percent tells us it’s “only 3%” of the books published in USA each year that are translations. (Of course 3% of a very large number is still a sizable number.) The Times Literary Supplement reviews several translated books in every (well maybe almost every) issue. Publishing is a funny business — like any business it’s main object is really to make money, and making money often seems to mean publishing too many meretricious books. Publishing does not exist to further culture or cultural exchange — the best we can hope to do is squeeze as much of that into the money-making program as we can get away with. So when English-language publishers publish translations it’s because they think they can make money by doing so. Ditto in reverse German or French publishers. Maybe because translations make up a higher proportion of the publishing output in say Germany, it is possible to make money more easily on a translated book than it is in America or Britain. This would explain too why it is that translations into English are published more often by smaller companies — they find it easier to show a profit on small books than do the big fish in our industry. So a) we publish plenty of translations and b) we can’t make much money publishing translations because the demand just isn’t there. But the higher demand for translated books in European countries does NOT derive from public virtue, from people’s greater cultural awareness. It derives from the relative lack of domestic product. Here’s a different take, from Publishing Perspectives again. A new wrinkle in the translation business is an ability given us by the evolution of the e-book. The original German-language publisher, say, can now (and in many cases is doing so) arrange for translations into English, French, whatever, and publish them themselves as e-books, without the traditional need to sell rights to an overseas publisher. This does of course involve an investment in the translation, but may make more foreign-language works available more easily in many markets. This machine arrived in the lobby at Oxford University Press, New York a couple of months ago. Not the clearest of descriptions, but one gets the idea. The star wheel would be used to apply the pressure to which of course the press owes its name. The plate would be fixed to the flat bed, not just laid on it, then inked. When the paper was put on top, pressure was applied evenly across the entire image — the flat bed would move under the roller I believe, not the roller move along the bed. The press would I expect be used for single page illustration tip-ins: engravings, mezzotints, halftones etc. 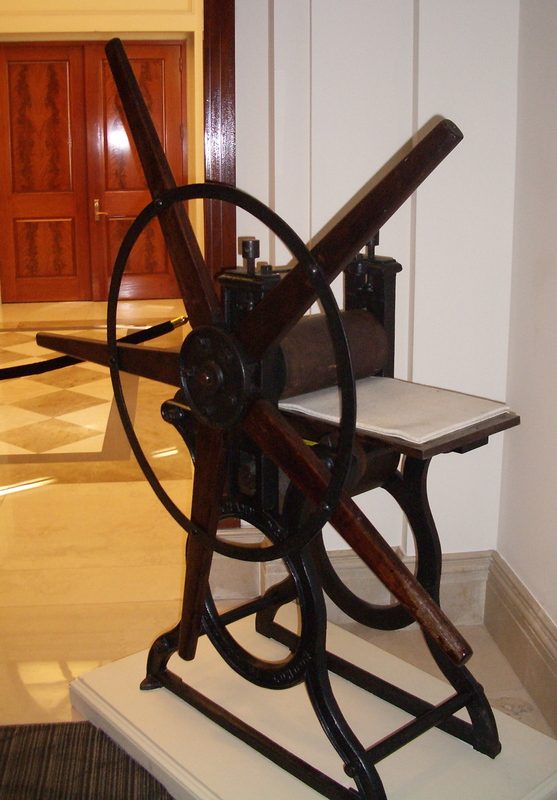 It could have been pressed into service as a proofing press for jobbing work. A press like this could be used for letterpress (most likely) or for lithography, printing direct from the stone. I promised a while back not to write about the future of our industry any more — and I won’t. But here’s a wide-ranging piece by the ever wise Gene Schwartz. It is a report on this year’s BEA, and touches on many of the issues affecting our business. When you click on the link you may get an advert. Just click “Skip this advertisement” to get to the essay. This message is directed to those among us who have dedicated our working lives to becoming expert print buyers, with an almost instinctive knowledge of where best to print this book in that quantity and what papers would be most appropriate and available on schedule. Apart from your knowledge of book manufacturing, your network of sales reps, customer service reps and other employees in a variety of printing companies enables you to find the answer quickly to any question which hasn’t come up before. But the writing on the wall poses a big question for you, with which unfortunately your usual sources are not going to be much help. Did you read the announcement of Ingram/Lightning Source and Courier’s strategic alliance? I think it’s a brilliant deal for both parties: Ingram get assured access to Courier’s wide-ranging offset (and ink-jet) offerings, and Courier can further consolidate their positioning as a total vertically integrated book company. In the press release pay particular attention to the bit about “Life Print” and especially the sentence “Through ‘Life Print’, publishers will reduce their operational, print and administrative costs with the fast, cost-effective and easy solution that integrates services to meet all of publishers’ print format needs”. Then think what “operational” and “administrative” costs might be, and how they might be relevant to you. Now this announcement should not be read as meaning that LSI or Courier have any plans to make you redundant — they are merely responding to customer demand. Your employers see outsourcing as a means of improving profitability in a time when pressures from the rapid changes of our business are making everyone nervous. As the ordering of printing becomes more and more a rote activity which even a computer could handle, print buying is one of the jobs easiest to forgo. Ingram now provides “publishing services” which can include print purchasing and warehousing to 86 publishing companies, some of which are large companies. The salvation of the book composition business has been full service for a number of years. Copyediting, proofreading and design have been being outsourced for at least 30 years. Now we find typesetters acting as liaison with printers, sending files direct to the printer for manufacture with standard specs. Do you really think a print buyer who’s only function is to email a print quantity, is really a bit of operational and administrative cost that is worth hanging onto? The case becomes even harder to stomach when you think of reprints — be worried if that’s what you do for a living. Now of course publishing companies evolve at different rates, and you may be working for one which is likely to be slower to change: maybe they’ll be slow enough that the old response to the threat of digital change “Well, book manufacturing will see me out through my working life” is actually going to come true for you. But don’t bet too heavily on it. Companies change — takeover, new management, economic crisis, whatever. What you MUST do right away is get some new skills. If you are a pure print buyer, one who fits the description in paragraph one, to claim “I’m certainly not going to learn Creative Suite” seems to me almost suicidal. Adobe’s software may not be the only thing or even the best thing you should learn (heck, even I am learning to use InDesign, Photoshop and Adobe Illustrator — and by the way they are now in the cloud, which means you’ll end up paying as you go I guess). I have previously advocated taking courses in digital publishing. If you do this you may not end up better at it than others, but you will have indicated an openness to change, and given your obvious ability of organize complex projects and your undeniable knowledge of the book business, you will be a not-unatractive candidate for a job. But if you insist that your skills as a print buyer are all you need, you will find you were mistaken (unless you are one of these few few few who are lucky enough to work for traditionally-minded publishers).